Phoenix, AZ (July 5, 2017) – Two weeks after Relentless Beats announced Goldrush Music Festival- a brand new experience heading to Arizona this November 18 and 19, the Phoenix based dance music and EDM promoter has released the first phase of its lineup for the Wild West concept. Taking place at Rawhide Western Town in Chandler, Arizona, Goldrush will be welcoming electronic dance music and hip-hop prospectors from across the country with some of the biggest talent from around the globe. 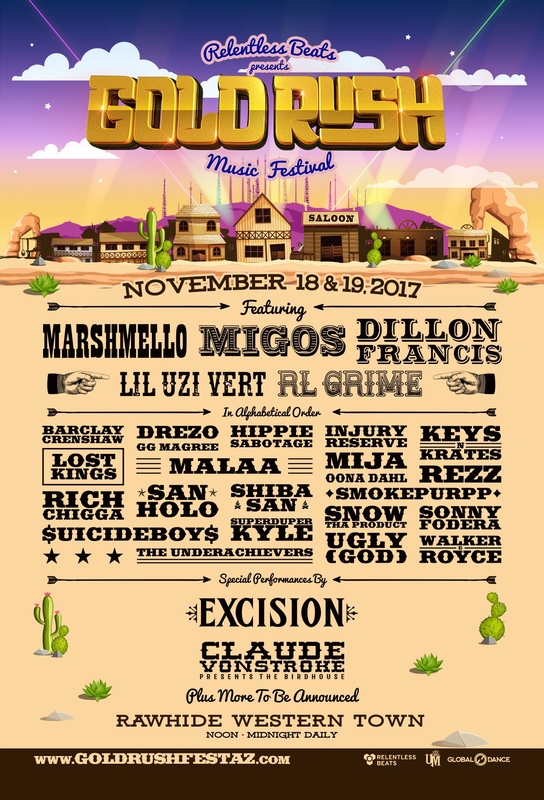 The first round of headliners for this new, fully immersive two-day festival will include: Marshmello; Migos; Dillon Francis; Lil Uzi Vert and RL Grime.